Wisconsin Gov. Scott Walker (R.) donned a pair of sunglasses and quoted from a Timbuk3 song Thursday to demonstrate that the economic future of his state is strong. Walker was speaking at the Wisconsin Manufacturers and Commerce's Future Wisconsin Economic Summit and spoke about the continued successes of the state's economy. The governor quoted Timbuk3's hit song "The Future's So Bright, I Gotta Wear Shades" to illustrate Wisconsin's low unemployment rate and growing economy. The unemployment is currently 4.1 percent, the lowest it has been in the state since February 2001. Following his speech, a few reporters noted that the 1986 song is actually about an upcoming nuclear war. "That's why I didn't quote the whole song. Having been from the 1980s, I actually know the words," Walker said responding to reporters' questions about the meaning of the song. Timbuk3, a punk-rock band, was formed in Madison, Wisconsin in the mid 1980s and achieved marginal success, with "The Future's So Bright, I Gotta Wear Shades" serving as their biggest hit. 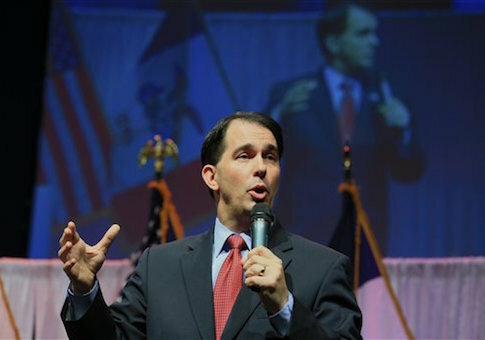 This entry was posted in Politics and tagged Economy, Scott Walker, Unemployment, Wisconsin. Bookmark the permalink.